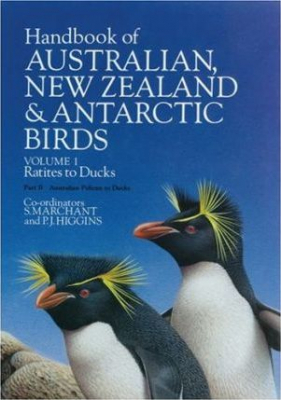 Handbook Of Australian Nz & Antarctic Birds Vol 1 : Ratites To Ducks - ubiq bookshop: the best place to buy books! 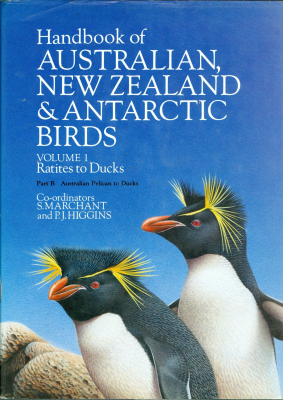 This encyclopaedic reference book covers all species of birds (including those recently extinct) occurring in Australia, New Zealand and Antarctica, as well as the Australian and New Zealand dependencies and sub-Antarctic islands. Volume 1 covers all species from emus to ducks. The text for each bird includes field identification, habitat, distribution, movements, food, voice, social organization and behaviour, breeding and plumage. There are colour illustrations of every species, showing developmental and seasonal changes in the colour of the plumage. Distribution both within and beyond the range is shown on maps. Line drawings of displays and other postures, diagrams of the annual cycle of each species, and sonagrams of important calls are also included.